Hey everyone! Here’s your long-awaited update about Gingersnap Hair’s new location. I wanted to wait until pretty close to opening day to avoid any confusion about where your appointment will be taking place as I make the transition over. After nearly a year of searching, wishing, hoping, and researching, I decided to stay solo and continue renting a salon suite for Gingersnap. I still dream of building a treehouse hair salon (sigh… one day it will happen! ), but I found the perfect place to land in the meantime. My new address: 10808 NE 145th St, Tangerine Style Suites, Bothell WA 98011. If you enter either “Tangerine Travel” or “Tangerine Style Suites” into your GPS app you’ll land in the right place! -If your appointment is on a Saturday, I will text you a code for the front door, in which case you just follow the hallway all the way back past the fireplace lounge area, and then take a right. -I will now be offering wine to my clients! My first day of work at the new location is 1/4/2019. If your appointment is before that date, please come to Redmond as usual! I will be checking in with everyone this week to make sure you end up in the right place. The painting is nearly done, so this place is going to be in top shape come next week. So excited to share a few behind the scenes photos with you in the meantime. Head over to www.instagram.com/gingersnaphair to see what I’ve been up to! Happy holidays to you and yours, and looking forward to a brilliantly beautiful 2019 full of great hair! I joke sometimes that I get to paint people for a living, but there’s some happy truth in that! We look to subtleties in color all around us- choosing from hundreds of white paint swatches to get the perfect brightness and mood in our homes, being particular about the colors we wear, having that most-flattering shade of red lipstick. We live, dream, and absorb color, all around us! Haircolor embodies all of these things for us. Some folks don’t consider changing theirs until society deems it necessary (sigh, those gray hairs), some take doing so as a crucial part of their identity (ahem, hi!). Color can brighten your face and mood, make a huge statement, and reflect your inner self on the outside. I take a lot of pride in constantly honing my craft as a haircolorist. Every person’s desires and palette are different- my brain loves a great challenge. There are few things more satisfying than seeing someone leave my studio uplifted and glowing. With NBR, the possibilities of what can be done person-to-person are blown wide open. Getting your ends white blonde, or that white blonde hair to be thick and lower-back length can be impossible in the “real world”. Not with Natural Beaded Rows! Part of why I chose this method to be my specialty is the absolute obsession with color behind the scenes. 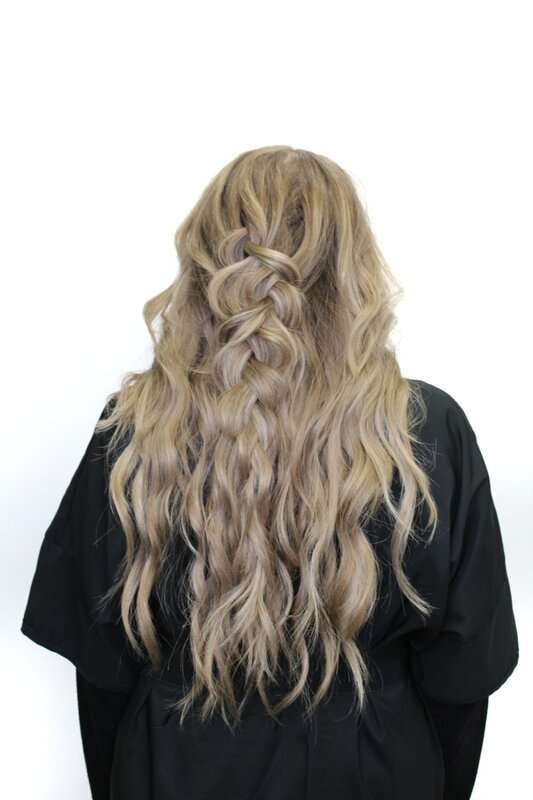 Every hand-tied weft of hair is individually colored, then layered into other wefts to create a color blend that looks like it is actually growing out of your scalp. The color possibilities are endless, to where you can choose a basic palette and actually swap out different sets of hair at each tightening. You can have the platinum Khaleesi hair of your dreams, or simply a little extra pop through your ends without bleaching your natural hair. You can have the fantasy rainbow unicorn hair you see all over Pinterest even if your natural hair is black or too fragile to withstand the processing. I’m seriously like a kid in a candy shop when I’m getting extension hair prepared for appointments. I train constantly in new haircolor techniques like root shadowing, reverse balayage and colormelting in order to bring my clients the most current, beautiful effects for their hair. This fall, it’s all about warm, rich, autumnal colors (of course! )- but also PURPLE. Pantone Ultra Violet is the contrasting tone that is showing up all over fashion and decor for the season. It’s also a FANTASTIC color to put into hair, especially mixed into brunettes. If you could have any color you wanted on your hair (ignore work, this is about you! ), what would you choose?